Do we need to wash our hair everyday? Back in elementary school, my mom would repetitively tell me to take a shower and wash my hair well every night. As I got older I began to question if this habit my mom created in my brain were actually good for my hair. My hairdresser began to tell me my hair was unhealthy and I needed to stop washing it so much. So which is correct, should we or shouldn’t we wash our hair regularly? The consumer goods company found that Americans shampooed their hair on average 4.9 times a week which is twice as often as the people of Spain and Italy. Even more interestingly, 40 percent of American women report shampooing their hair daily. Angela Lamb, MD, an assistant professor of dermatology at the Icahn School of Medicine at Mount Sinai in New York City states, “Shampoo traps oils, so if you do it too frequently, you may dry your hair out, leaving it prone to breakage. Hair produces natural oil called sebum, and shampoo is an emulsifier that captures and traps excess oil, dirt, and product residue, which you then rinse out to clean the hair.” These oils that the shampoo removes are essential for healthy hair. Two studies were conducted by Dr. Raymond F. LeRoy, MSc published in The Journal of Orthomolecular Medicine testing the negative side effects of washing hair. In the first study, ten randomly‑selected samples which were analyzed prior to washing were chosen. Each sample of hair was split into two equal portions and cut into lengths of 1 mm or less before the experiment had begun. The samples were then washed for 10 minutes in deionized running water, drained and then dried for three hours at 110 degrees Celsius. The samples were then taken out of the heat and were covered overnight. In the second study ten randomly‑selected samples which were uncut, were analyzed prior to washing were chosen. The samples followed the same procedure as in the first study, but there was no cutting involved. Directly after the washing and drying had occurred, the samples were cut into 1.0 mm lengths, or less, and then put through evaluation. These studies showed excessive loss of calcium, sodium, and potassium in the hair, and the results were even greater for females. In Study 1, females on average lost 21.6 percent of the calcium in their hair, 35.3 percent of the sodium in their hair and 25 percent of the potassium in their hair. Males lost significantly lower calcium, only loosing 10.5 percent, but they were similar in the results with sodium and potassium, loosing on average 31.75 percent sodium and 20.75 percent potassium. One of the things I did not expect was that there is a drastic difference on the loss of minerals in your hair depending on when you cut it. 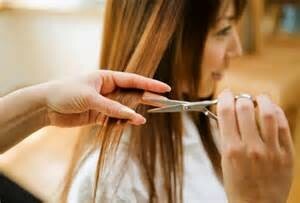 In study 2, cutting the hair following washing it, women on average lost 49.5 percent calcium content in their hair and 36.5 potassium in their hair, although they lost less sodium on average, with a 22.5 percent loss. Males mineral loss were again much lower, with 15.83 percent loss of calcium, 18.83 percent loss of sodium, and 19.83 percent loss of potassium in their hair. This makes me question why hair salons wash your hair before they cut it. Overall, It is important to decrease the amount of times you wash your hair, if you want to reduce breakage and have lively, healthy hair. Also, next time you go to get a hair cut, try asking your hair dresser to cut it before they wash it. This will conserve minerals in your hair and you will ultimately have a better outcome. Hair is essential to defining ones self, it is important to keep it healthy and lively! This entry was posted in Uncategorized on December 4, 2015 by Jessica Nicole Greenhut. I personally wash my hair everyday, and I think it is interesting that women are more affected by damaging their hair due to over washing. I also think it is very interesting that hair salons cut your hair while it is wet, when you are loosing less minerals if you cut it when it is dry. I’ve always known that washing your hair every day was bad for you! I try to tell my friends and they never listen, so I’m glad someone wrote a blog about it. Towards the end, I was very surprised! I had no idea that hair should be cut when it’s dry. I wonder if cutting hair when its dry affects the look or outcome of the haircut, and maybe that’s why hairdressers choose to cut it when its wet. I think you could have elaborated a little more on why hairdressers cut wet hair in the first place. If you ever want to learn more interesting facts about your hair, check this out! there’s is a huge difference between wetting your hair and washing your hair. there are lots of rumors about cleaning hair. Excessive washing of hair does causes hair damage. it’s just not like what people think frequency of washing does not harm hair. the blog you write indicates a strong relationship between frequency of washing and damage level. However, correlation does not equal to causation. there probably a third variable in between, like if the conditioner applied or blow-dryer applied. All this hair jargon is very new to me. I know nothing about the potassium, sodium, or calcium content of hair or why it’s needed and what it does. But I have just made the decision to grow my hair to really store up some good old fashioned minerals. And to answer your question about hair washing, I don’t have anyone wash my hair but my barber uses a spray bottle of water to wet the hair before cutting it because it’s simply easier to cut. After reading this article, I’m really scare right now. I wash my hair twice a day because my hair is easy to get messed up in the morning. I have been doing this for already three years and now I find out my hair is really hurt and not as good as before. In this article, there are several evidences can prove the shampoo is really hurt people’s hair. But here is a question, will it be better if people use shampoo and hair conditioner in the same time, will it decrease the harm to the hair?